In this blog, you will learn about the basic types of SQL statements with examples. SQL refers to Structured Query Language, as it is the special purpose domain specific language for querying the data in Relational Database Management System (RDBMS). Microsoft SQL Server, MySQL, Oracle etc. use SQL for querying with slight syntax differences. In Data Manipulation Language(DML), we have four different SQL statements. Select statement is used to select the collection of records from the table, which is based on some condition. E.g. select * from student – Get all the records of student table. Select * from student where rank>5 – Get the records with the condition where students' rank is greater than 5. Insert statement is used to insert the set of values into the table. Update statement is used to update the existing values in the table, which is based on some condition. The query given above will update the studentName from Manoj to Kumar where student Name Kumar. Delete statement is used to delete the existing record in the table, which is based on some condition. The query given above will delete the record which has StudentName Manoj. 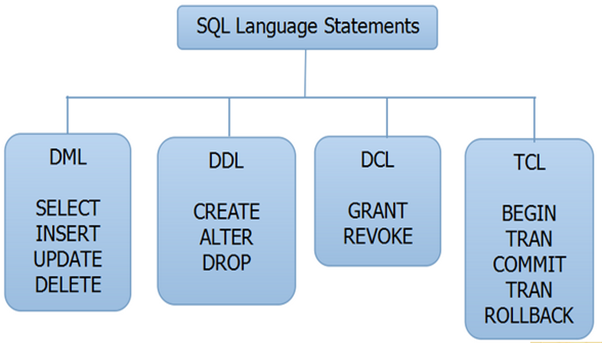 In Data Definition Language (DDL), we have three different SQL statements. Create statement is used to create the new table in an existing database. Alter statement can add a column, modify a column, drop a column, rename a column or rename a table. SQL DROP TABLE statement is used to remove a table definition and all the data, indexes, triggers, constraints and permission specifications for the table. Grant is allowed to do the specified user to the specified tasks. It is used to cancel previously granted or denied permissions. In Transaction Control Language (TCL), the commands are used to manage the transactions in the database. These are used to manage the changes made by DML statements. It also allows the statements to be grouped together into logical transactions. Rollback command is used to restore the database for the last committed state. It’s also used with save point to jump to the save point. Save point command is used to temporarily save a transaction, so that you can roll back to that point whenever necessary. These are the different types of statements in SQL language. I hope, this will be helpful for the readers. Thanks for reading.